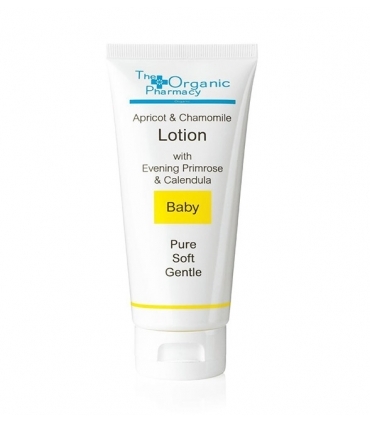 Lightweight and nutritious body lotion for babies, tremendously delicate, it absorbs quickly without leaving sticky residue, suitable for the skin of the body and the face of the little ones. Light and nutritious lotion with aloe vera, apricot, marigold and evening primrose oil that keeps baby's skin smooth and smooth, in very good condition. It absorbs quickly without leaving a greasy or sticky feeling. Apricot Oil: Excellent for skin care. Calms, moisturizes and nourishes. It is a soothing oil that is ideal for the skin of babies. Calendula: Anti-inflammatory. Aimed especially for all reactive, red, irritated and itchy skin. It is the plant of babies and all those people who want to take special care of their sensitive skin. It is very soothing, it brings well-being. Nourishes and moisturizes. He treats many conditions, especially dermatitis. It is healing and provides well-being to dry and rough skin. Aloe Vera: Regenerates, cleans, calms, disinfects and is very safe. It is very healing and antibacterial and accelerates the recovery of small wounds, like that of your navel. Relieves your irritations. Coconut Oil: Nourishes and moisturizes. It improves the conditions of the corporal skin. Strengthens all tissues and maintains healthy skin. It has fungicidal and antibacterial properties. It supplies to the skin all the fatty acids and vitamins necessary for the repair of the skin. Sesame Seed Oil: Its fatty acids are very moisturizing and moisturizing. They keep water in the cells longer. Calms irritations. Jojoba Oil: Hydrates and nourishes. Treat eczema. Shea butter: Multi-benefits, especially for the sensitive skin of babies. Contains fatty acids and vitamins that fight irritation and diaper dermatitis. It is anti-inflammatory, moisturizes and moisturizes, reduces redness, reduces the pain of discomfort and regenerates. Use the amount needed to moisturize and smooth the face and body skin. Aloe (Aloe Barbadensis) *, Coconut Oil (Cocos Nucifera) *, Sesame Seed Oil (Sesamum Indicum), Jojoba Oil (Simmondsia Chinensis) *, Shea Butter (Butyrospermum Parkii) *, Behenyl Alcohol, Glyceryl Stearate, Rye Alcohol *, Soybean Sterols (Glycine Soya), Apricot Oil (Prunus Americana) *, Honey (Mel) *, Marigold (Calendula Officinalis) Extract *, Phospholipids, Xanthan Gum, Ceteryl Alcohol, Vitamin E (Tocopherol), Chamomile (Anthemis Nobilis), Evening Primrose (Oenothera Biennis), Alcohol, Glycerin (vegetable) *, Honeysuckle (Lonicera Japonica), Sodium Lactate, Essential Oils, Linalool, Limonene, Geraniol.